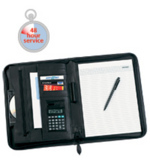 Our Conference zip round folder with logo comes with an enclosed calculator and numerous pockets. This A4 Conference zip round folder with logo has a solid steel feel. In a leather-look PVC material, this item also includes a pen and pad. Dimensions: 340 x 260 x 35mm. Print area: Front: 120 x 250. Other promotional and personalised items besides our Conference zip round folder with logo click here. To find out more about our Conference zip round folder with logo click here and fill in the contact form and we'll get straight back to you. More amazing ideas from Calender Lady Promotions.